Students at London's Imperial College are developing a version of Atari's classic Pong that can be controlled by the blink of an eye. 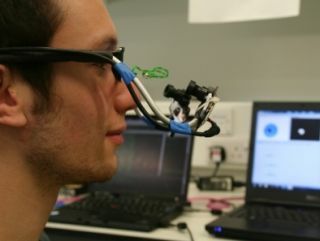 The students, under the supervision of Dr Aldo Faisal, have used off-the-shelf components that track eye movement and enables a user to play the game hands-free, via some rather strange looking spectacles. The ICL students constructed the spectacle-controller for US $37, connecting an infra-red sensor and a webcam to a pair of glasses to track the movement of a player's eye, then sending that data to synchronization software which translates it into paddle movement in Pong. The potential application for this type of technology – both in terms of gaming and in terms of potential new interfaces for those suffering from serious medical conditions that limit their ability to move their hands – is clearly massive. "We hope to eventually make the technology available online so anyone can have a go at creating new applications and games with it and we're optimistic about where this might lead," said Dr Faisal. "We hope it could ultimately provide entertainment options for people who have very little movement. In the future, people might be able to blink to turn pages in an electronic book, or switch on their favourite song, with the roll of an eye." The team is currently working on a new pair of specs that will track both eyes.